As I had alluded to in the opening blog for 2014, this is the year of themes. The theme for the first quarter (Q1) of 2014 was pretty obvious - pathogens, bugs, or whatever name you would like to give the pesky critters that cause us to lose sleep over managing outbreaks and HAIs. Have you picked up the theme for Q2? It's the story of how to choose a disinfectant, or in the very least areas that should and need to be considered outside of focusing on what a product kills and what a product costs so that the most effective environmental hygiene program can be justified to the powers that be. It's a story that Lee and I have been weaving throughout our blogs since we started back in May of 2011 when we introduced the Talk Clean To Me blog and our mantra of clearing away the haze of smoke and mirrors marketing that surrounds disinfectants. As Lee discussed in last week's blog "The little devil or the little angel, which do you choose?" 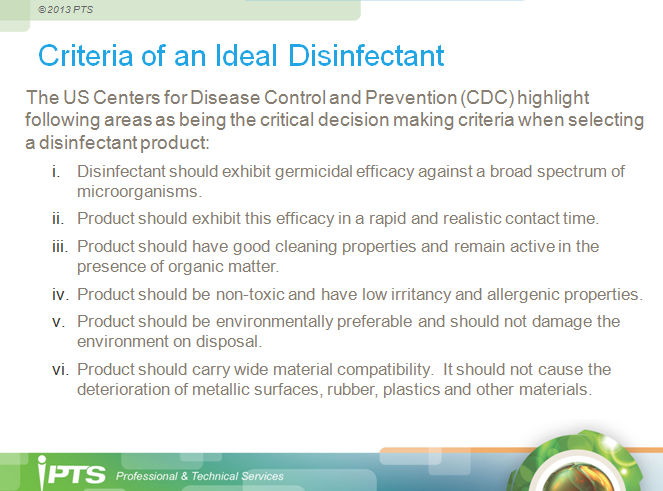 developing the business case to justify moving to a new disinfectant is not as easy as one would hope. The unfortunate truth being that it is more often than not easier to remain as the status quo then trying to be that fish swimming upstream. Here's where we hope we can help. For those of you who have seen Lee or I speak, the picture used for this week's blog is a slide that is used in almost EVERY one of our presentations. If you look back through our blogs, we have written one on virtually every topic: Strength is not always found in numbers, Dirty to Disinfected in 60 seconds flat, To Clean or Not to Clean, Is PPE the necessary evil?, What's in Your Bottle? and The Unintentional Consequences of Improving Infection Prevention, and while we recognize the importance of understanding the theory we have gone to provide the tools to simplify things and help you make the right decision for your facility. Selection of a disinfectant really can be made as simple as tabling out the desired traits of a disinfectant and adding any criteria that is specific to the needs of your hospital. You can in turn develop a rating system that would allow you to more objectively look at the overall picture and how the product answers the needs of your facility - keeping in mind of course that you'll never have a single product for everything...well unless of course you want to be dealing with calls over ruined surfaces due to material compatibility or occupational health and safety complaints associated with occupational injury from inappropriate use of a product! Here's a snap shot of what my table would look like (click here for the full Disinfectant Product Assessment Tool). Voila! You now have a comprehensive and reasonably objective Disinfectant Product Assessment Tool that can be used to compare product to product. Certainly, bias may come through if say you have a better relationship with one supplier than another or if (as Lee stated last week) you play the part of the Devil by simple inactivity or complacency of not wanting to go through the effort of converting to a safer and more effective disinfectant. But, if you take the time to work though this assessment tool using the EPA Approved label and product MSDS, you may be surprised by what choice you make!